MyArtWorld,Islamabad brings you a two person show by Amber Arifeen & Sana Saeed from Aug 16th – 31st 2018 and we get the scoop from Curator Zara Sajid on what to expect;. 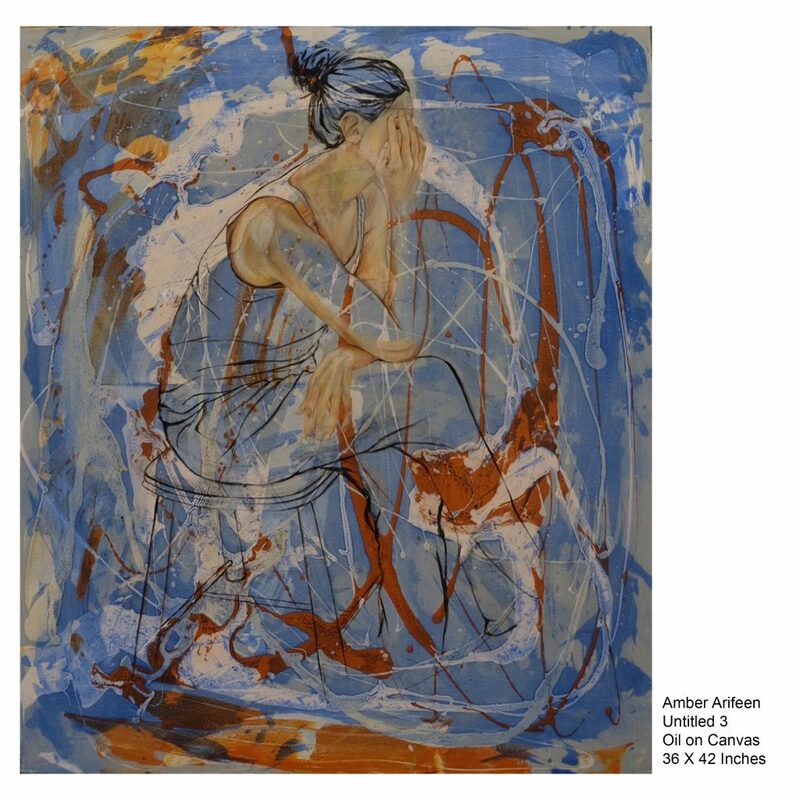 Amber Arifeen’s work is informed by the ever-vexed relationship between the feminine form and space. The anxiety to contain and conceal oneself in a public setting stems from an inexplicable aversion to one’s body, as if the very contours of the female form are cause for offense. Her work explores and problematizes this dynamic. 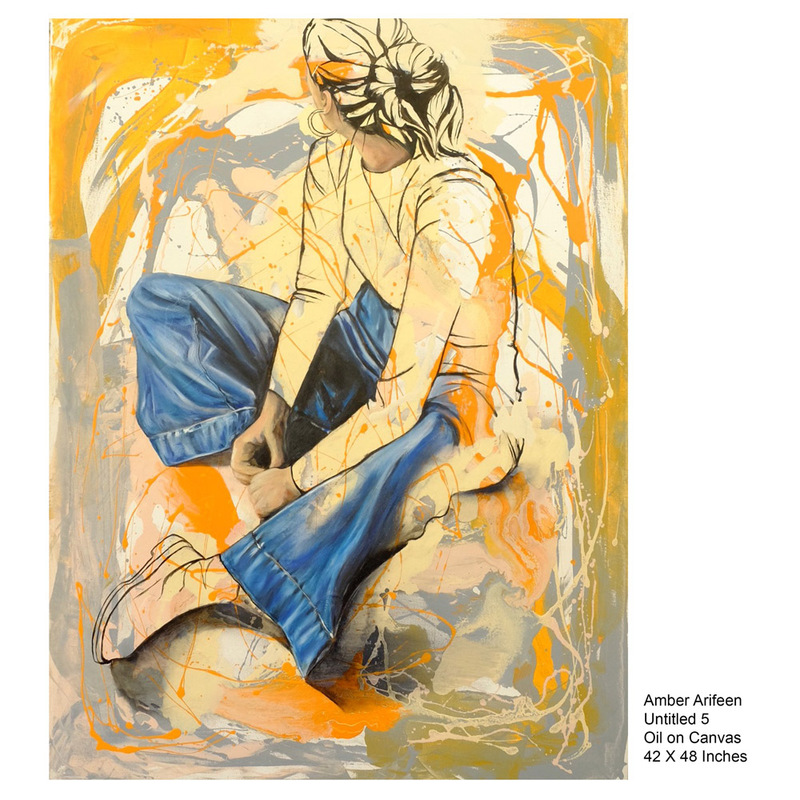 In this series, Arifeen presents urban women in domestic settings, enlarging their presence on the canvas through unambiguously masculine posturing. Each subject is shown dominating the literal space of the frame; more importantly, the women claim space by elongating, stretching, sprawling their bodies, as if to assert their presence in an otherwise vacant setting. Their body language suggests control and certainty, while the masculine attire underscores an aura of nonchalance and unspoken power. 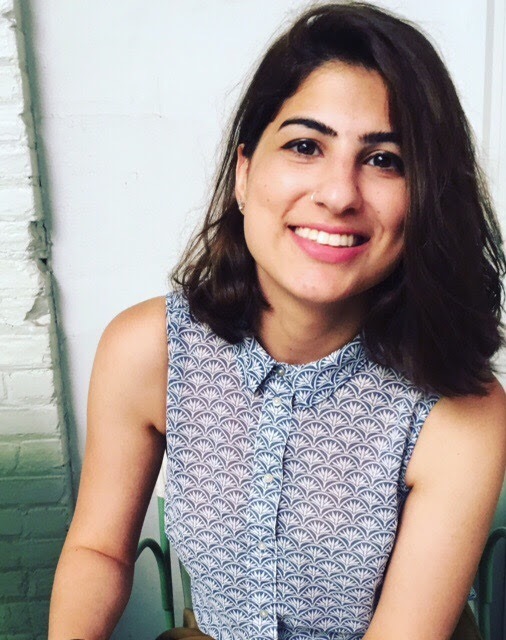 Arifeen’s work highlights the subtle strategies—what we might call “woman-spreading”—that challenge the discourse on women and space. 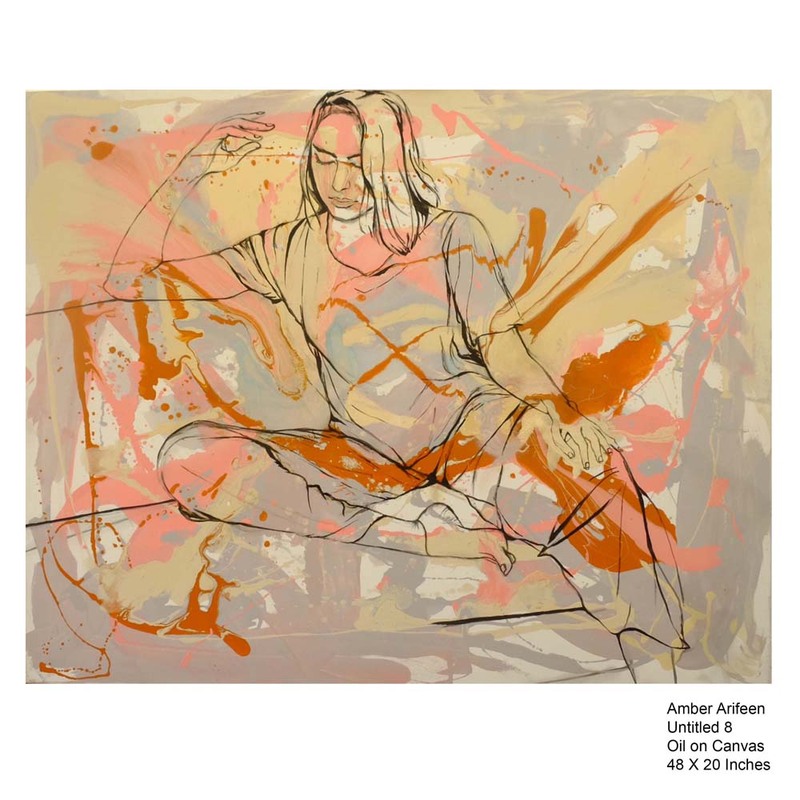 The subjects are rendered in clear and bold strokes while colors spill from the outline, creating a playful contrast between the languid poses and the chaos surrounding them. The clarity of the feminine form amidst vibrant and untamed strokes begs the question of whether there can ever be harmony between mind and body, desire and discipline, speculation and reality. Ultimately, each painting poses itself as a challenge to the viewer, a dare to imagine women as engaging in the simple act of existing unadorned and unapologetic, questioning the boundaries of their bodies, the space they inhabit, and the interplay between the two. 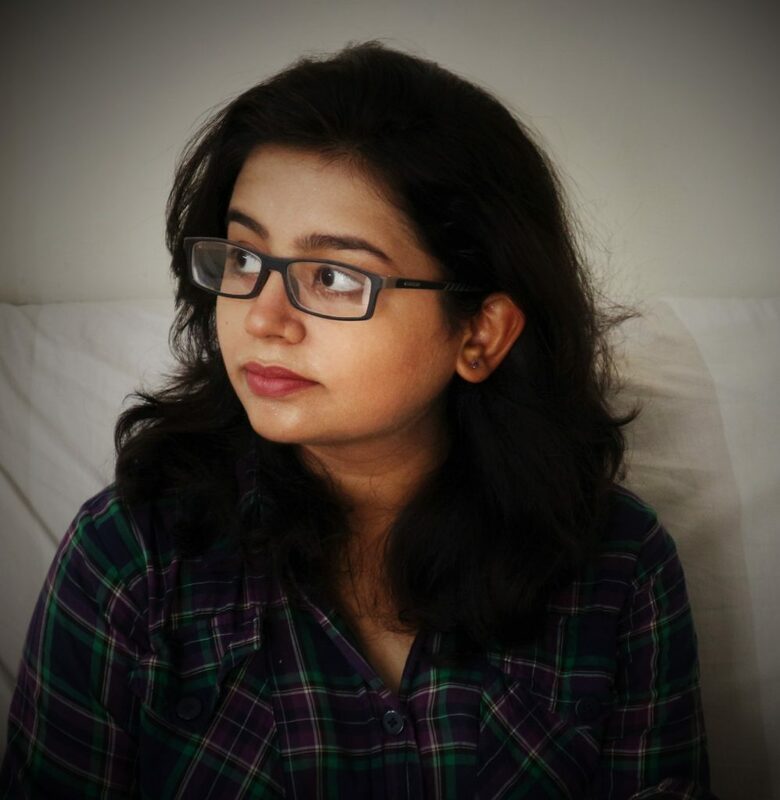 Amber Arifeen is a self-taught painter based in Karachi. She has displayed at MyArworld, Islamabad, Alliance Françoise in Karachi and to private collectors. This series of paintings is experimental as Amber explores and discovers her artistic voice. We always leave a mark behind. It could be a physical mark on any surface or a nontangible mark floating in your memory. For Sana, “to live is to leave traces” and her artistic practice revolves around these traces. Marks on walls, doors, stains on clothes and dust particles on different objects document time and memory. Someone who was once present to leave a trace behind. Her work focus on the uncertainty of life, for a moment you are present in the strongest appearance and in the second moment you are not. She talks about the “nothingness” which lies between present and past, a stage where person loses his/her sense of belonging. Sana uses various mediums to record the presence of time which is embossed in countless surfaces around us. She does not stick to one medium because she believes every memory and trace demands its own medium that’s why mediums like installations, photography, film, writing and painting are used. She digs deep inside the surface of these neglected marks and develops a conversation with them. Sana Saeed is a Lahore based practicing artist. She completed her degree in visual arts from NCA in 2017. With a major in painting she also learnt calligraphy and film making to enhance her artistic expression. Sana has displayed her work in different galleries of Pakistan, including Canvas Gallery Karachi, Artscene Gallery Karachi, O Art Space Lahore and Zahoor-ul-Ikhlaq Gallery Lahore. Her recent show was a solo in Taseer Art Gallery Lahore.